For the next week or so, the theme around here at Time Eternal is time and illness. I’ll soon be posting a podcast episode in which I talk with my friend, Elissa Bjeletich, about her experience waiting for her daughter to receive a liver transplant. In the meantime, however, I had the opportunity to talk with Kevin Allen, a long-standing contributor to Ancient Faith Radio. Kevin is the sort of guy a lot of us content producers look up to and try to emulate. Sadly, however, you won’t find him in any current shows on Ancient Faith–in 2016, he was diagnosed with ALS, a debilitating neurological disorder that has no known cure. I asked Kevin if he’d be willing to share his thoughts as to how his experience of time has changed over the course of his battle with ALS. I’m grateful he took me up on the offer–his thoughts were both a comfort and challenge to me, as I’m sure they will be to you as well. NR: First, for those of us who aren’t as familiar with your story, can you tell us a bit about your experience with ALS? When were you diagnosed? What effect does ALS have on the body? KA: When I was still hosting Ancient Faith Today for Ancient Faith Radio in 2015, I noticed that my voice was becoming a bit slurred and raspy. I went to my ENT and she thought it was a vocal cord issue, so she did a procedure to plump up my vocal cords. However, it did not wok. At the same time, my wife checked online and was concerned to discover that such a voice symptom could be the result of Amyotrophic Lateral Sclerosis (ALS); so, she suggested I see a neurologist. The neurologist did an electromyogram (EMG) test. During the EMG, the doctor inserts a needle electrode through your skin into various muscles. After the testing, she told me that I had ALS in May of 2016. I have a rarer form of ALS called Bulbar Palsy onset ALS. It starts in the throat and then moves to other areas. At this point, I can barely speak. My wife can only understand about 10% of what I say, but I have a speech device that I can type into. My fingers no longer work effectively and I cannot button shirts or use a pen effectively. My left leg and foot are not working well so I need to use a walker. Eventually, I assume, I will be in a wheelchair. I can still swallow, thank God, but at some point that may end; I recently had a feeding tube procedure in anticipation of that. The major symptom, though, is general weakness and overwhelming fatigue. There are days when I can barely stand up due to weakness. NR: Was your diagnosis a shock? Elizabeth Kübler-Ross talks about the five stages of grief that patients with terminal illnesses experience after diagnosis—shock, denial, bargaining, depression, hope. Have these cycles of grief been your experience following your diagnosis? KA: I have to say I was a bit prepared for ALS because my wife did the research. I hoped it wasn’t ALS (because I knew there is no cure) when I underwent the EMG test, but I was not entirely shocked when my neurologist and another specialist gave a second positive opinion that I had ALS. My wife and daughters started crying when the specialist confirmed the diagnosis. I am familiar with Kübler-Ross’ work and the stages of grief that patients with a terminal diagnosis go through. However, I sort of prepared myself beforehand and decided as an act of will that I would not go through this grief process. Rather, I wanted to see this as God’s way of giving me time to prepare myself for my repose. Being honest, there was some initial depression and even bad dreams in the first few days after the diagnosis. However, I decided thereafter that I would believe totally in Christ and His saving grace and would not stay depressed or upset or question God. NR: When you were diagnosed, were you given any kind of temporal prognosis—e.g. a timeframe for how the disease would progress? If so, how did that feel? Was it at all helpful to put numbers on your future? KA: ALS is a complex disease and takes a very individual trajectory in different patients. I know a man who died of ALS within six months of his diagnosis; some live for 4-5 years; and Stephen Hawking has lived for over 40 years with ALS. So there is no definite and specific prognosis for ALS patients. However, my neurologist said that the average life expectancy is 2-5 years. How did I feel? I feel as if I am coming apart. We are supposed to be aware of our mortality in Orthodox Christianity, but I think most of us look at our mortality in an abstract or theoretical way. So I had a different outlook on life after my diagnosis as I can no longer live as I have. But I know that God decides when we leave this life, so I try to be completely dependent on God and live day by day. NR: In illness, time can take on a sort of excruciating slowness. There is a lot of down time, resting, and waiting—for test results, pain to subside, healing to happen (or not happen). Most of us aren’t good at waiting in the best of circumstances. How have you navigated these “slow times” of illness? Are or were they a struggle? What advice would you give to people who find themselves in the seemingly endless, waiting seasons of sickness? KA: Yes, in illness time is the problem, although the Fathers and Mothers tell us that dying of a sudden death unprepared is not the best way to die. Waiting around for the serious progression of the disease to evolve is difficult. I try not to speculate or think about the future, but try to live in the moment with God, which makes this much better for me. I would suggest to people of faith that they shut out – through an act of will or with anti-depression medications – the depression and try to live minute to minute with a clear sense of God being with you. People without faith will undoubtedly have a harder time dealing with a terminal illness. 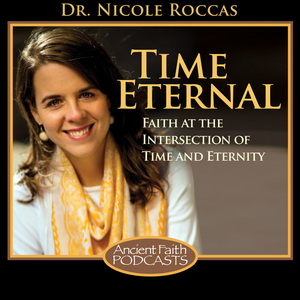 NR: How else has your perception of time (and eternity!) changed since your diagnosis? KA: Well at first, I had to deal with my own faith. It was initially shaken up a bit once I was told I would be dead within 2-5 years. But I read the scriptures and a few other books, and told myself that I would believe everything that God revealed. I find now that time is sort of like a merry-go-round, knowing that it ends at some point. I see eternity as another way of life that I am not familiar with – not simply an extension of this biological life – but I have total confidence that God will prepare me for it, as He prepared me for this life. NR: I don’t know if it’s our death-denying culture or what, but I almost feel like I need to apologize before asking a question about mortality. But this is something you must think about a lot—and the Fathers of our Church counsel us to remember our own deaths, to live with our End in mind. So, forgive me if this is taboo, but how has your illness changed your relationship with death? How has the awareness of your own mortality shifted, expanded, or grown? Has such a shift been spiritually beneficial, or detrimental, or both? KA: I am grateful to God that He has given me time to prepare myself through reading scripture and prayer and receiving the Eucharist. I am not worried about dying. When the time comes, I hope to be praying the Jesus Prayer and submit myself to God. As I look back on my life so much of what I have done in my life has been a distraction from what is essential. So, the reality of death has been spiritually beneficial to my faith and my living. 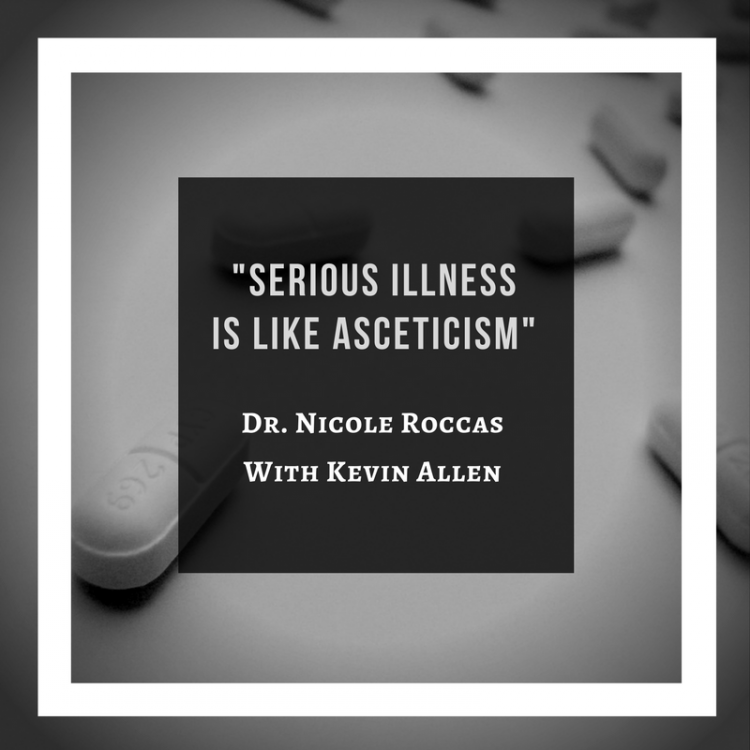 As some of the fathers say, serious illness is like asceticism. NR: Something I’m constantly asking at Time Eternal is how to reclaim or redeem time for eternity—not just theoretically, but in the lived experience of everyday time. In your illness, how do you carve out space for eternity? Are there particular times and places that bring you eternal comfort? Are there particular writings or books that you find yourself going back to during this time? KA: Well the Fathers say that the way to redeem time is through prayer. The problem, however, is that when one is ill, at some point being disciplined with your prayer rule and prayer in general becomes more difficult. Then one can basically turn your life, pain, suffering, and affliction over to Christ in the hope of sharing in His suffering, and His Resurrection! Christ is heaven, so when we strive to be united with Him through prayer, faith, memory, the Holy Eucharist, icons, etc. we are carving out space for eternity. I pray the Jesus Prayer much of the day and when I go to bed, and it takes away all the anxiety. 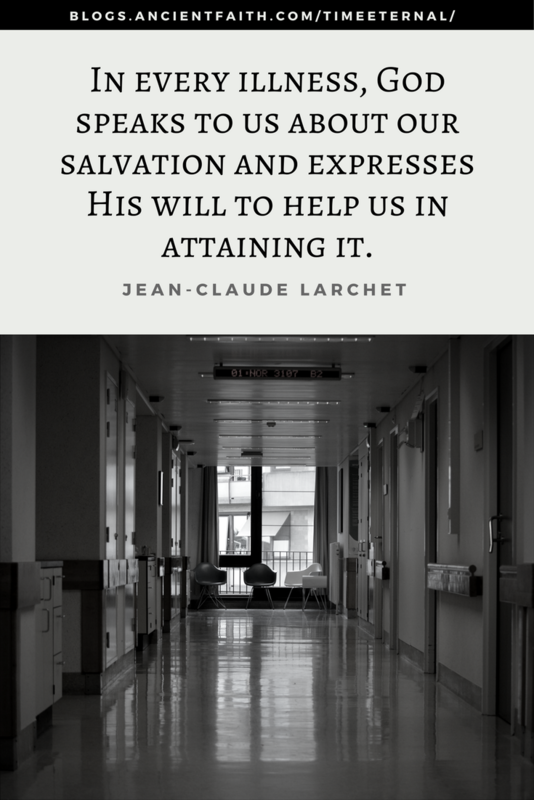 The one book other than the Bible I recommend is The Theology of Illness by Jean-Claude Larchet. NR: I’m just being totally honest, here: when I hear about the experiences of people with a terminal illness, a large part of me desperately hopes and wishes something like that never happens to me. Part of me maybe even thinks I am invincible to that sort of thing. I don’t know why–rationally that makes no sense. Perhaps this is a healthy response to some extent, but it also comes out of my human impulse to avoid suffering—to avoid (and at my worst moments, even scoff at) the narrow way of the Cross. I’m afraid that if I ever receive a diagnosis like yours, I will grow totally despondent and bitter. How do you guard against the hardness of heart that can creep into one’s spirit when life doesn’t go as planned? Do you think there’s anything people like me—who are not facing a terminal illness or major trial at the moment—can do to better face our own suffering? KA: That’s a great and significant question! Elder Sophrony wrote, “The way of the Christian is crucifixion,” so we know we will be dealing with some hardships that God Himself (through Christ) experienced (“Man of sorrows, acquainted with grief”). I think the way to deal with life and the suffering and afflictions that come with it is to realize that this life is the doorway to eternal life and joy in Christ. Whatever happens to us is temporary and ultimately for our spiritual benefit. The Fathers say that becoming despondent or bitter does not benefit one spiritually. 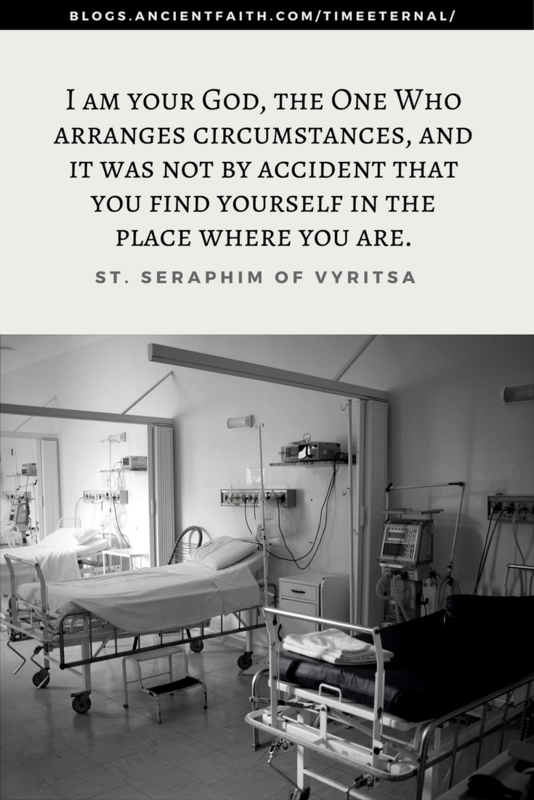 As St. Seraphim of Vyritsa wrote, “I am your God, the One Who arranges circumstances, and it was not by accident that you find yourself in the place where you are; this is precisely the place I have appointed for you” (The Spiritual Testament of St. Seraphim of Vyritsa, Russia). Leaving family and loved ones is indeed the most difficult part of facing death; however, this temporary life–if lived in Christ–leads us to a much better existence. If you’d like to read more from Kevin Allen about the experience of illness through the eyes of faith, make sure to read his thought- (and soul-) provoking essay, “Discovering Life by Facing Death,” written a scant handful of months after his diagnosis in 2016. Kevin Allen was the host of The Illumined Heart and Ancient Faith Today for Ancient Faith Radio starting in 2007. He attends St. Barnabas Antiochian Orthodox Church in Costa Mesa, California with his family. Thank you for posting this touching and profound interview with Kevin. I have listened to a lot of The Illumined Heart and Ancient Faith Today and these remain some of my favourite podcasts on AFR. They have really helped me gain a better understanding of Orthodoxy and I am deeply grateful to Kevin for his hard work in preparing and presenting them. It is sad to hear of the progress of his illness, but his response is inspirational and Christ-centred. May we all have the same response to our mortality and the way we spend the time allotted to us. He and his family will be in my prayers. Thanks Dan! Kevin’s interview really puts things into perspective for many of us. I don’t think bodily death is part of God’s ideal for us, but He uses it for our salvation. I’m thankful to people like Kevin who have the courage to face and communicate this struggle to us in a redemptive, life-giving way. Thank you Kevin. Your witness to Holy Orthodoxy was a huge part of our entire family’s conversion. Memory Eternal.